I get a lot of people telling me that they think my life is enviable. I don’t know if I’d go that far. It isn’t easy being out here and not ever really knowing exactly where is home. Each day brings some new challenge, or just being bored. Seems like it’s one thing or the other. Silence, I don’t get enough of it. People are loud. Sitting in a truck stop and trying to work as writer is damn near impossible. My nerves are so frazzled from day to day that I’d just like to find a dark corner and hide in it half the time. I’m aggravated today, though I cannot say that it has been a bad day. I’m under pressure to get home. I want to get home. To me, home is Illinois. Home is where my heart is in so many ways. It’s true, I don’t let much hold me back and when I’m ready to go, I am used to just going. For the last three months I have been more “stuck” than I have ever been. First I had an oil leak to contend with. Nothing was going to stop me though. I did a repair myself that would have probably cost $600 anywhere else. I spent about $40 to fix it. I’m a very determined person when I get something in my head. Yes, you can call it stubborn if you want, but it has served me very well over the years. Don’t tell me I can’t do something because I swear to you that I will prove you wrong. Now, my next issue to tackle is tires. 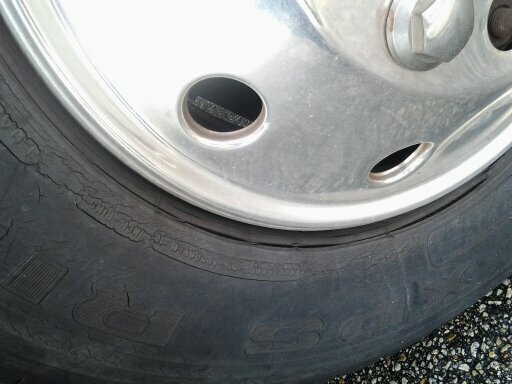 I have tires that are in scary shape. I can’t find any used ones where I am at. I’m scared to drive any further without them and I’m not in the position right this minute to get new ones. In a couple of weeks I might be. I am trying to work all I can. My fingers actually hurt from typing. I’m spending more than I want to, at a truck stop, just to eat every day. If there was a store close, I would shop and be able to eat cheaper. I feel caught between a rock and a hard place and it makes me a little crazy. I don’t like being forced into situations and not having the ability to just leave. Last night I went to bed a little sorrowful. I try to keep my chin up, but the loneliness is more than you can imagine. My conversations are typed back and forth with people so very far away. My human interactions are limited to the people who are strangers that I strike up a conversation with here and there. I feel isolated from the ones I care about and want to see. My sleep has been fitful as I’ve had so much on my mind. I just want to be somewhere that I don’t feel on guard and I can relax. I’m tired. Eventually I did drift off into dreams and first thing this morning I got the sweetest email from the one I want to see the most. She told me I was amazing. Perfect timing. When I was feeling the most defective and the most worn down by the world, she reached out and reminded me that I wasn’t. She started my day off perfectly. I miss her. I need her hugs right now. Even though I am tired and I am weary, I truly wouldn’t trade a moment of my life over the past few years. Everything has been a lesson learned and a trial that has taught just how strong I can truly be. This is just one more trial. I’ll survive and maybe I’ll learn some patience as I go? When it comes to having dreams, I truly believe that they don’t fall in your lap. Don’t be afraid to run down your dreams and pick up whatever is yours. Even though I’m a little down today, I’m heading down the road soon, running down my dreams and pickin’ up whatever is mine.